Drink Mochi: Delicious Snack or Silent Killer? Mochi: Delicious Snack or Silent Killer? Nine people died this week after choking on mochi in Japan. The Associated Press reports that in Japan at least 128 people were rushed to hospital in the first few days of 2015 as a result of choking on mochi—the sticky, glutinous rice cakes that are traditionally eaten over the New Year. Nine of those cases were fatal. One of the victims was an 80 year old man in Nagasaki who choked on a bowl of sweet bean soup with mochi that was distributed for free at a Shinto shrine. According to the Guardian, several people die every year in Japan due to mochi-related asphyxiation, and 80% of those fatalities are elderly. As Japan’s population ages, authorities are trying different methods to combat the problem. According to the Guardian, Fukunao Medical Foods in Osaka has developed a less sticky mochi that is easier to swallow. The Tokyo Fire Department has a website that explains how to administer first aid to someone who is choking on mochi, reports CBS. 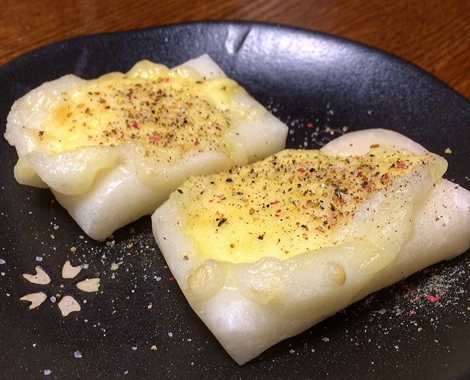 And every year, Japanese officials advise people to cut the rice cakes into bite sized pieces and to chew them slowly and carefully. They might want to bulk buy Hapiforks to drive the message home.